My literary interests don’t usually extend to picture books, but every now and again one tickles my fancy. Such is the case with Grumpy Badger’s Christmas. Deep in the forest, all the animals are decorating for the holidays, but Grumpy Badger just wants to be left alone. He checks and rechecks his spring provisions and settles into a cozy bed. But three visitors interupt his nap, and a community crisis finally changes his attitude. The story elements shadow Charles Dicken’s A Christmas Carol. 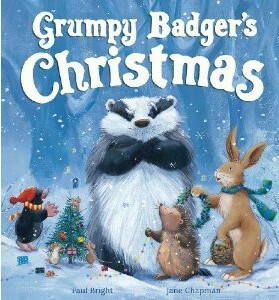 We have Scrooge in the form of Grumpy Badger, three nighttime visitors, a needy public and a final reformation. It’s cute, predictable, and satisfying; appealing qualities for young readers. It is the pictures, however, that won me over. Jane Chapman creates the most becoming forest scenes, with textured, snowy backgrounds and adorable animals who look as if they might jump right off the page and offer their hand in greeting. She brings to life a forest community in such detail that I find myself wistfully longing to become a part of it. The kid in me wants to join the festivities in the clearing and explore the quaint dwellings. I’d love to peek into Badger’s snug little tree home and perhaps share one of his goodies over a cup of tea. The characters are so beautiful, so animated, that I’m quite certain I could become good friends with each of them. My son must have felt the same way, because this Christmas, I’ve had to read this library book to him no less than fifteen times. And I-an adult-have enjoyed every reading. That’s a pretty sure sign of a great book.